The Centre congratulates Dr Kate Fennell (née Gunn) who is a 2017 South Australia Tall Poppy Science award finalist. The award recognises intellectual and scientific excellence of young Australian scientists. Kate is a Research Fellow at the Sansom Institute for Health Research in the Division of Health Sciences at the University of South Australia. She is also a practising clinical psychologist and member of the Freemasons Foundation Centre for Men’s Health. Kate was nominated by her supervisor, Professor Ian Olver AM who is head of the Samsom Institute, and medical oncologist, cancer researcher and bio-ethicist, and former chief executive officer of Cancer Council Australia. 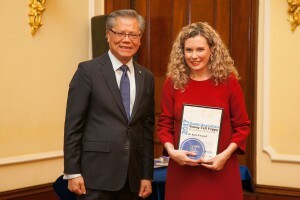 Kate received her award from His Excellency the Honourable Hieu Van Le AC, Governor of South Australia at Government House (Pictured left ). Kate received the award for her achievements in the field of cancer supportive care and rural public health. Kate will be involved in science communication activities in school students as part of her Tall Poppy award commitments. This is to promote study and careers in science and also promoting science to the broader community. This is now the third young researcher affiliated with the Centre to receive this prestigious award. Dr Luke Selth (Dame Roma Mitchell Cancer Research Laboratory) and Dr Camille Short (SAHMRI) are previous recipients. This entry was posted in News, Research and tagged award, cancer survivorship, rural health, scientific excellence, tall poppy. Bookmark the permalink.